Interview with Kenneth Lim, Chief Technology Officer of the Maritime and Port Authority of Singapore. How can robot ships patrol Singapore’s harbour; resupply vessels; and guide tankers into port? This is a question on the mind of Kenneth Lim, Chief Technology Officer of Singapore’s Maritime and Port Authority. The view out of his window shows hundreds of container ships queueing to enter the World’s second-busiest port. While currently manned, the entire industry is automating and experimenting with new tech. “Imagine every ship just having one drone, what can they do?” Lim says. 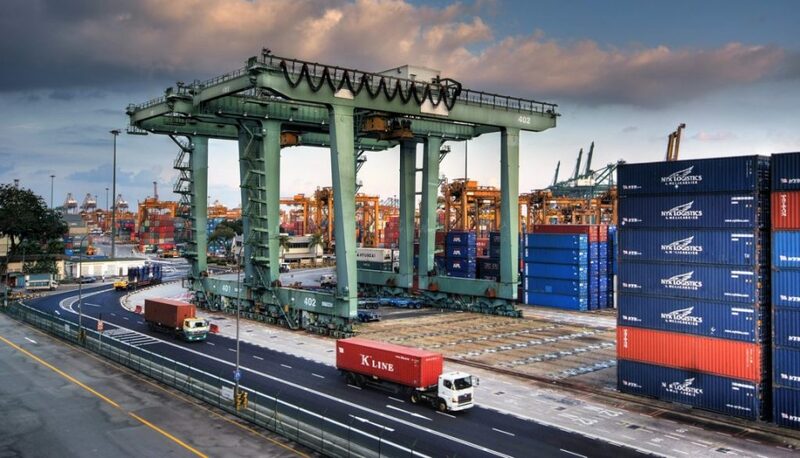 These kinds of questions have always been crucial to Singapore’s port, which has constantly invested and upgraded to retain its global position. Lim shares his vision for the future of the industry; and the challenges that disruption will bring. Unmanned Autonomous Vehicles (UAVs) are at the centre of this transformation. They have the potential to reduce manual labour; handle more dangerous tasks; and increase surveillance for detection of threats. Drones and robots are able to access places where humans cannot. “We used to tear down the ship to survey the whole tanker. How much time is spent doing this whole survey?” With drones, Lim says, they are able to scan the ship much quicker and easier. The Port Authority now has a “drone estate” on Marina South where they test out how they can be used in the maritime industry. Airbus and Willhemsen, a global maritime group, are already testing the use of drones to deliver goods from shore to ship without docking. Lim reveals that the MPA is also looking at using automated tug boats equipped with sensors to detect and collect garbage at sea. This way, a previously time consuming and manual task can be controlled from a single command centre with the touch of a pedal. While there are worries that jobs may become irrelevant due to automation, artificial intelligence is not ready to take over port operations just yet. Lim points out that digitalisation will, in fact, give experienced older workers the ability to keep contributing to the industry. An example is for sea-weary captains, seafarers, and engineers to work from a command centre instead of being out at sea. “Now we just have dashboard monitor on, and with their seafaring experience, you can tell these engines don’t sound right, don’t look right”. This is only made possible because of digitalisation, he says. Even as automation replaces manual roles in the maritime industry, industry experience still matters in rolling out solutions which work. This is the kind of tech ecosystem which MPA wants to create. The port industry has a traditional structure, but tech is turning this upside down. Officers can now work with fintech applications to reduce the amount of paperwork required; and partner with healthcare startups to keep tabs on the wellbeing of crew who have spent a long time away from home. Lim wants to look outside the maritime sector in providing solutions, such as in the use of UAVs. “Drones seem to be very mature on land. But in the sea actually they face a different problem; they cannot land autonomously because of the sea state,” explains the chief technology officer. Local Startups can help tackle this problem. “What are the other solutions that are used in other sectors? Or can I have very niche kind of solutions that can be used for specific problems?” These are the kind of questions Lim wants industry players to start asking. The MPA is bringing the port to startups by “plugging into the bigger startup ecosystem,” with Pier71 (Port Innovation Ecosystem Re-imagined) – a programme which bridges startups with the maritime industry. Lim says it is about creating an environment where you can matchmake startup technology providers to specific pain points in the industry. Lim wants to bring startups together with experienced older sailors and let them experiment together. He is doing that through his ‘Living Labs’ programme, where workers can try out the latest ideas. “You have all these technology, but you need to bring them down to a level where maritime colleagues can see and feel, “ he says. Yet a perennial problem may yet hold things back, Lim warns. Cyber security is “the second side of the same coin”. There are so many files and records in the port system, it’s essential to be proactive in stopping data getting hacked. International cooperation is crucial. Ports share lessons on threats with one another. They can also work to subvert time-sensitive ransomware by making use of different time zones, he says. “This becomes a global community who work together to prevent some of these cyber liabilities or threats from disrupting the whole maritime [industry] because it has a big repercussion to the supply chain, logistics and end users”, he warns. Cyber risks exist across every industry, however, and it isn’t holding back the MPA. The whole industry is changing where traditional players are feeling the heat – and not just from their competitors, but from customers who are coming up with their own solutions. He is determined to keep his colleagues in the know, and up to date with the latest tech. “Otherwise they may think that [change] is five years down the road, but actually it’s just six months away”.